Major Abu Dhabi-based developers launched several new projects at Cityscape Abu Dhabi, which concluded on a high note last month (April 19 to 21). The ninth edition of the UAE capital’s largest property show, held at the Abu Dhabi National Exhibition Centre (Adnec), has been a hotbed of activity with major announcements unveiled by Abu Dhabi Urban Planning Council (UPC), Department of Municipal Affairs, Tourism Development and Investment Company (TDIC), Zaya, and Al Forsan Real Estate. Organised by Informa Exhibitions, the event hosted exhibitors from the Cayman Islands, Egypt, Jordan, Lebanon, Kuwait, Latvia, Nigeria, Portugal, Serbia, Thailand, the UK and the US. Talal Al Dhiyebi, chief development officer, Aldar Properties said: “We launched three residential developments, two on Yas Island and one on Reem Island. After selling out Al Merief land plots in less than a week to Emiratis, we decided to launch West Yas, which is 1,000 villas on Yas Island for UAE nationals only.” (See UAE Focus). Bloom Holdings said it launched five new projects at Cityscape Abu Dhabi, all of which have proved to be a big hit with both local and regional investors. Ali Eid AlMheiri, executive director, Mubadala Real Estate and Infrastructure said: “Al Maryah Island is Abu Dhabi’s international financial centre and urban hub for hospitality, leisure and retail. Cityscape Abu Dhabi has been an important platform for us to showcase the Grade A commercial space in Abu Dhabi Global Market Square, the on island development opportunities. 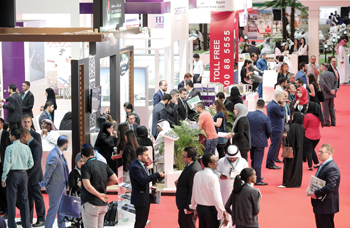 Cityscape Abu Dhabi welcomed more than 130 regional and international exhibitors this year, with next year’s edition scheduled to be held April 19 to 21.